Situated in the eastern part of the inland northwest, Xingxia is at the Great Bend of the Huanghe River. 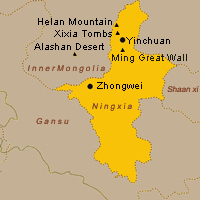 Northern Ningxia is surrounded by Inner Mongolia while the southern part is bounded by Gansu Province and on the east by Shanxi Province. It was once an important stop along the north Silk Road, connecting the central Asia, north desert and inland plains. Yellow River winds through Ningxia, forming the spectacular Shapotou scenic zone. 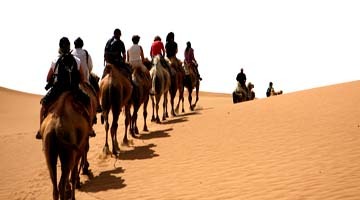 Tengger Desert and its huge sand dune another attraction to Ningxia. Other famous sites in Ningxia include the ruins of Ming Great Wall and gorge; Xixia Tombs site; the remnants of nine Western Xia emperors' tombs and two hundred other tombs lie within a 50-km² area; Helan Shan, the mysterious 108 dagobas, the twin pagodas of Baisikou. Ningxia is the smallest and newest province in China (6 million pop.) and was created as a Muslim Autonomous Region for the Hui minority people in 1958. The Hui people are the descendants of Muslim traders who arrived via the Silk Road starting in the Tang dynasty and have assimilted with the Han Chinese over the centuries. Ningxia is one of the poorest provinces in China and almost all the provinces wealth is concentrated along the Yellow River Valley in the northern part of the province.The main claim to fame for Ninxia is the Xia Dynasty 10-13 Century which was a Buddhist kingdom created by the Tanguts, a group that was ejected from the Tibetan Plateau and created their capital near present day Yinchuan (750,000 pop.). The Xia Dynasty was responsible for the creation of several thousand Buddhist statues,grottoes and temples across northwest China in Gansu, Qinghai and Xinjiang.The Xia Kingdom was conquered by Genghis Khan in 1227. Most of Ningxia is desert except for a few forests located on the slopes of Helan Shan,the chief mountain range which is located in the northern area of the province. The Yellow River or Huang He, the second longest river in China originating in Qinghai Province, cuts across the north of Ningxia and is the major economic corridor of the province. In the southern areas of Ningxia, the desert without the major river valley is harsher with low population levels and a few Muslim villages,one modest city and abandoned ancient cities.